Welcome everybody to language-easy.org! Well, I hope you are seated and really motivated – today we will talk about one of the most horrifying topic of German grammar: The German genders. So, in case you don’t understand why people who learn German don’t like this topic.. Did you know that horse is neuter, a guitar feminine and a dog masculine? Although this does not sound too logical, there are some rules that can guide you to determine which noun has which gender. So, in the following, we will try to structure the nouns into different categories which can help you indicating the German gender. 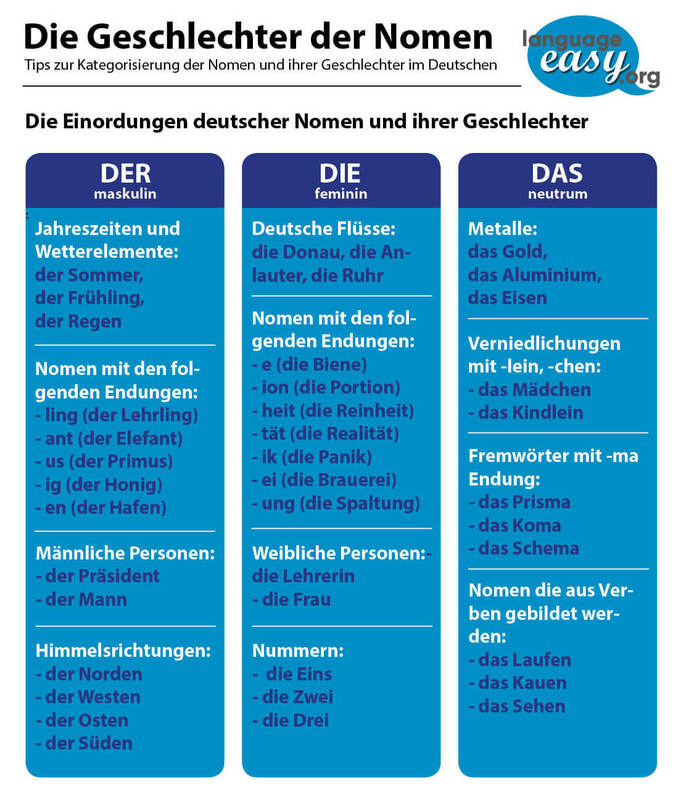 By the way, our article about German articles can also help you to get an overview about nouns and their German gender. Now, let’s not lose too much time and come to the categorization of German nouns and their gender. Well, as already mentioned above, we will try to categorize German nouns in order to determine to which of the three German gender they belong to. Of course, most of you know that there are three German genders: Masculine, Feminine and Neuter. So, the masculine article is “der”, the feminine “die” and the neuter article “das”. In the following, we will try to outline the rules for nouns of each gender in the German language. So, try to keep these tables in mind. For sure, other German speaking people will be impressed by your German gender skills. Finally, we come to the last category of noun and their German gender, the gender of compound nouns. In case a noun is formed from several other nouns combined into one world, the last noun in the word determines the gender of the whole word. Finally we have reached the last part of this article where you can proof the German skills you have just learned. In the following you will see some phrases that you should complete with the correct terms. Once you have filled all the gaps, just click on the “correct” button and you can see your errors and the correct results. So, I really hope that you have understood the basic principles of German genders – and that you keep the tables from above in mind. By the way, in case you’d like to have some background information about this topic, just have a look at this article on Wikipedia. Auf Wiedersehen!